What is going on at James Price Point? Save The Kimberley has been paying attention to what is happening on the ground and offshore from James Price Point and we are not pleased with what we see. The proposed major gas and industrial hub proposed for James Price point is now referred to by the state government as the ‘Browse LNG Precinct’ in advertising and media releases. The massive and polluting plans do not yet have Indigenous, Environmental or final corporate joint venture approval and are strongly opposed by most of the local community. Save The Kimberley is working with Traditional Custodians, community, politicians (including Bob Brown), business leaders, high profile artists and celebrities, environment groups and providing our knowledge, support, voice and action to ensure that the Kimberley is saved. Nonetheless the company Woodside is drilling offshore and has undertaken surveying in preparation of clearing and drilling onshore. 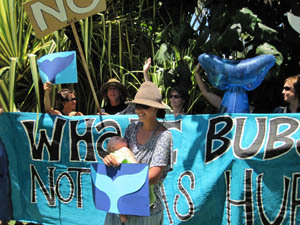 Local community greet WA Premier's announcement of marine parks in the Kimberley as insufficient and 'Greenwash' covering his plans to endanger whale nursery areas and drive an 'Industrial wedge' into the Kimberley. The message is "Whale Bubs - Not Gas Hubs"
The Premier has announced a process of Compulsory acquisition of the land from Traditional Owners, many of whom are opposed to the proposal. This has sparked outrage and accusations of ‘land theft’ from Indigenous people, organisations and human rights advocates. The compulsory acquisition process which would presumably benefit private companies including the oil and gas multinationals is allowed for in the law if it is ‘for the public good’. Whether or not destroying James Price Point is in the public good or not is yet to be tested either in the courts or by consultation with the local and Australian people. Woodside and the Colin Barnett lead state government have been working hand in hand to push through a development in the Kimberley. Along with parts of the Federal Government they are dragging venture partners Shell, Chevron, B.P, and B.H.P, Traditional Owners, and the local/world community into conflict over the environmental and cultural values of one of the most pristine and valuable areas in the World. The joint venture partners, economic analysts and environment groups have for years pointed out that THERE ARE ALTERNATIVES. The gas can be processed in established industrial areas, offshore, or left in the ground as we move to a renewable energy future. Those analyzing the project and companies involved in the project have suggested that using the gas to extend the life of established LNG processing plants in the Pilbara would make better economic sense. The Japanese and French Inpex and Total Browse venture has decided to process gas in Darwin (further away than the Pilbara option) proving that this is both technically and economically viable. The State Government has ‘green lighted’ near shore exploratory drilling and surveying where blasting of reefs, extensive dredging, massive breakwater construction and industrial jetty/wharf building are proposed. Onshore plans are well advanced for a huge clearing and aquifer draining bore drilling program. Despite appeals being lodged by Save The Kimberley and other groups and community outrage the government departments, including the EPA and the state Environment Minister look set to approve large scale clearing, drilling and construction of large (but probably inadequate) dams set to start any day now! 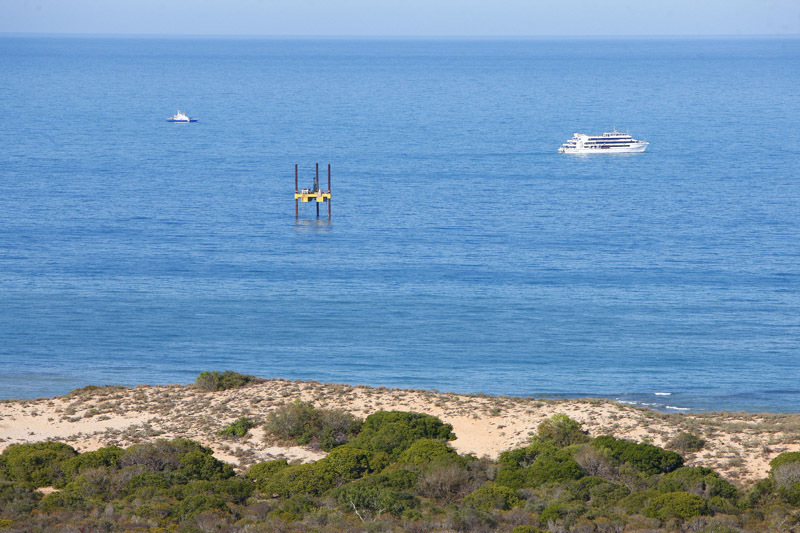 These exclusive photos show drill rigs and support boats offshore from the proposed industrial facility and port at Waldaman (James Price Point), just north of Broome. 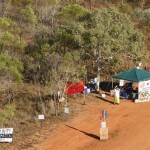 Community information booth at the turnoff toward James Price Point, viewed from the air. 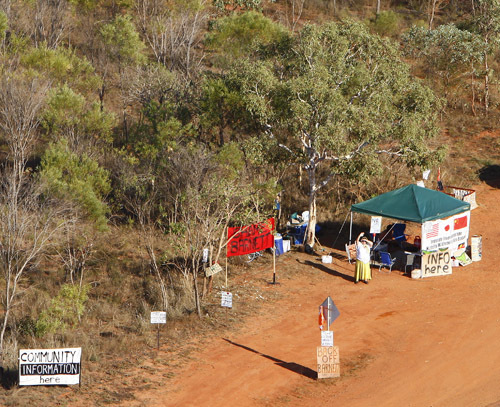 After successfully organising the largest march and rally ever held in Broome and possibly Australia (per capita), the local community have established an information booth at the highway turnoff toward James Price Point and have noticed what looks like clearing equipment heading North. There are serious concerns that clearing and drilling will damage Country and is not necessary as the proposal increasingly and inevitably looks like not proceeding. The tide has turned – this is the line in the sand. Save The Kimberley and the mass movement of community common sense will not allow this short term industrialisation plan to compromise the future of the World Heritage worthy Kimberley. Sensitive vine thicket in the foreground, drill rig in the background - clearing and drilling at James Price Point must be stopped before irrevocable damage is done. This entry was written by Sweep, posted on October 25, 2010 at 1:36 pm, filed under Actions, BP, Chevron, Culture, Environment, EPA, General information, Government, humpback whales, Indigenous, Industry, News Archive, Shell, Woodside, Woodside. Bookmark the permalink. Follow any comments here with the RSS feed for this post. Post a comment or leave a trackback: Trackback URL. Hi. I was one of the photographers who were featured on Stateline a few weeks ago. I’d like to ask if STK would like to join us (the photographers, led by Christian Fletcher) in an exhibition and awareness campaign starting in Perth? Why can’t you people see the beauty in nature? I really wish you would stop trying to earn money on projets that damages out world. I spent most of my early adult years in the kimberley, and to see the continuation of greed and stupidity from the west australian government as it has always been in this area puts a spear through my heart, when will they stop the destruction of western australia and its treasures.